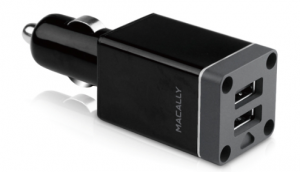 Macally is an international designer and manufacturer of Mac/PC equipment and gear for your iPad, iPhone, and iPod. This company started in the early nineties as a manufacturer of Mac specific products (hence the name, an ally for your Mac), and since then, they have developed an innovative, high quality, cross-platform and competitively priced line of Macally brand products. Today, we are going to take a look at a few of Macally’s products for our Apple gear. The great thing about having a MacBook Air is portability. It is so light and thin that bringing it with you when you are traveling, or just walking around the house, is a no brainer. All of that movement exposes your portable to the normal wear and tear one might expect, especially external scratches and scuffs. Computer bags are great, but you have to pull your MBAir (MacBook Air) out of the bag to use it, once again exposing it to danger and scuffing it up when you place it on a table. Like many MBAir owners, I hate covering up my portable, but the Macally Protective Case Cover for the MBAir is a good compromise because it looks great and protects your precious investment all at the same time. 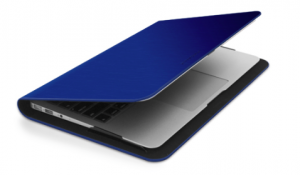 The outside of the case is constructed of a soft vinyl-like material with a brushed metallic finish while the inside is a very soft suede like material with form fitting clips that hold your MacBook Air in place. It was a simple task to slide the MBAir into the grooves and bend them out slightly to clip around the screen and the base of unit. Once clipped in, your laptop can not slide out. It is just as easy to remove your portable computer from the case. When you open up the folio style case your MBAir is open and ready for action. This is a portfolio type of case and the sides are open. You can access all of the units ports and slots with the case closed or open. This is handy because the power outlet is easily accessible. On the other hand, dust and other things do tend to congregate on the little overhang which I brushed away from time to time. The case does add a little weight (1.2 pounds) but it did not take away from the MBAir experience. I am not sure how much protection this case will provide when you drop your computer, but the edges are stiff and should be able to absorb some of the shock and prevent the edge of your MBAir from hitting the floor. These cases come in sizes that accommodate the 11” or 13” MacBook Air models. If you travel, either for business or pleasure, and you have multiple devices that need charging, this is a great little accessory. This car charger plugs into a power port in your car (or the cigarette lighter if you have one of those) and offers two USB ports for simultaneously charging two devices. I had my iPad and my iPhone both plugged into this device in my car and both showed the charging icon while connected. Offering dual 5V/2.1A ports the charging wasn’t super fast but certainly was adequate. The unit is black in color and a nice feature is a small glowing strip of light along the edge of the charger that lights up the ports so you can see them. This came in especially handy with my car’s black interior. This is a handy device to own. 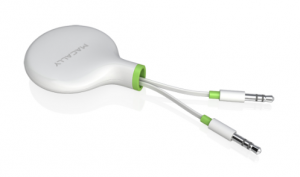 If you use your iPod/iPad/iPhone/Mac portable (or any other device with a 3.5mm audio out port) with a speaker, and you carry around a speaker cable, the Macally retractable audio cable is a useful device to own. Rather than being stuck with a five foot cable you have to wrap up this cable retracts into the plastic housing when you are done using it. This device features two 3.5mm male plugs and the cable pulls out, locks in place, and retracts very easily. You have to be careful to pull both cables out at the same time and retract both at the same time. Yes, there were a couple of times the cable jammed which is typical with retractable cables in my experience but it does beat the heck out of the tangled cable I carry around now. If you use your iPod/iPad/iPhone/Mac portable (or any other device with a 3.5mm audio out port) and you want to share the audio portion, this connector is for you. I know on past car trips with my three boys we have portable DVD players and two or more sons wanted to watch the same movie at the same time while my wife and I wanted to listen to an audiobook or something else at the same time. You can image all of the competing audio in the confines of your car in a situation like that. The Macally 3-way audio splitter would have been the perfect solution for this problem. Small and light, completely functional, this item is a must have if you need to share the audio feed of any device.